Hey! If you have been following my Insta Stories on @sunshinekelly2988 you must noticed about my 7 Days 7 Korean Mask Challenge. So here is about a bit of my self-care regime that I try to incorporate into my daily skincare routine. Mask everyday… err day! Make it a habit and it’s a good one for my skin, why not? You know, most Korean girls have flawless glass skin because they use mask every day and in Korea this is called, 1 일 1. I hope I can have flawless glass skin like them too. However, remember ya there is no ugly women, only lazy ones. Reminding myself don’t be lazy lazy and remember mask mask mask everyday. Just in case you have missed out or skip part of it, fret not I have compiled all my 7 Days 7 Korean Mask Challenge insta stories in youtube here. So do check out and follow my 7 days with The Face Shop sheet masks journey. Every day I use different type of masks. Oh yes!!! For those who wish to start your daily Korean mask challenge or routine. The Face Shop Malaysia is having promo BUY 15 FREE 5 pieces sheet mask for Bio-Cell, Herb Day, Mask Lab & The Solution Masks in November & December at all stores & estore www.thefaceshop.com.my. So don’t miss out your everyday mask routine ya! My skin type is dry and hydrated so most of the sheet masks that I picked are either moisturizing, brightening, and firming. Hey! after I completed my 7 Days 7 Korean Mask Challenge I find that it has become like a daily routine for me after I cleanse my face, tone, then mask and then followed by my regular serum and moisturizer. Yes! I definitely see so many improvements on my skin conditions, of course the hydration and radiance improved. My skin is plumped up, skin texture is smoother and I find that my makeup looks more natural and last longer. Overall I find that THE FACE SHOP sheet masks are amazing and the prize is very affordable most of them are about RM10 to RM12. 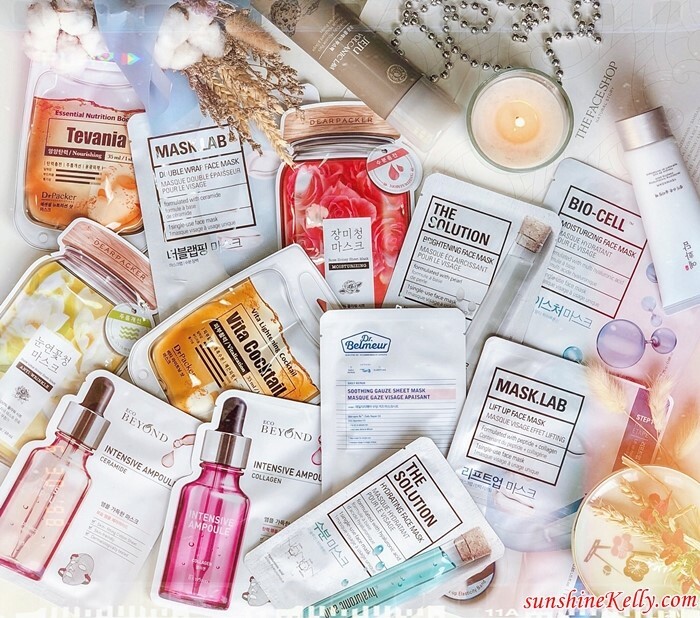 And now is the time to stock-up your sheet masks and grab their BUY 15 FREE 5 promo going on. Just in case you need to check out what masks is available and suitable for your skin, you can refer to some of the information here. Lifting: comes with two separated mask sheets for tightening skin texture and lifting up the sagging skin (ear-hook band type for jaw line). Moisturizing: intensely moisturizing mask features a double-wrapping sheet with a layer of special film that locks in moisture and effectively promotes the absorption of ceramide serum. Brightening: it is a light-as-air sheet that feels soft and weightless on skin. The serum containing Pearl powder provides a brightening solution to dull skin. The mask is very comfortable and stick like my second skin. Hydrating: it is a light-as-air sheet that feels soft and weightless on skin. A serum containing Hyaluronic Acid helps dry, thirsty skin lock in moisture. Moisturizing: I love bio-cellulose mask sheet mask texture that fits onto your face like second skin with skin-friendly ingredients that provides professional benefits to solve the skin concerns. Anti-Sensitive: This is the best mask to soothe redness and irritated skin, it’s perfect for sensitive skin users. A low-irritant calming and moisturizing sheet mask with Lanseal, an excellent moisturizer that keeps skin hydrated and cool for a long time. Moisturizing: this facial mask contains Ceramide, which is a natural skin moisture barrier to keep moisture within the skin and keep it healthy. Anti-Aging: this mask is saturated with an essence containing collagen components which is essential for the overall health and reduce the appearance of fine lines and wrinkles. Moisturizing: a combination of gentle flower and honey. Highly concentrated ampoule without stickiness, moisturizing film like jelly. Anti-Aging: this is an anti-wrinkle mask sheet with non-sticky concentrate ampoule and firm jelly moisture shield gives moisture care. Another way to replenish skin moisture by using this revitalizing sleeping pack that restores fresh deep moisture overnight, leaving skin instantly refreshed in the morning. I love the mousse pack compared to the clay or cream. It is lighter and easier to spread with rich whipped cream-like foam texture. The mask contains Jeju volcanic lava that softly applies and removes impurities within the pores without any tautness and leaves a moisturized finish. It is important to cleanse our pores and scrub or exfoliate the impurities and dead cells to that our skin can absorb the essence better and more effective.